If you want to celebrate New Year’s Eve in San Francisco, you can find plenty of things to do. Some of them are obvious: All the big hotels and large event spaces will have parties. They’re fun but expensive. A list of some of the best of them is below. But there are more ways to ring in the new year than that. The rest of this guide highlights alternative ways to celebrate that cost less than the annual budget of a small country and don’t require buying a fancy pants outfit, either. 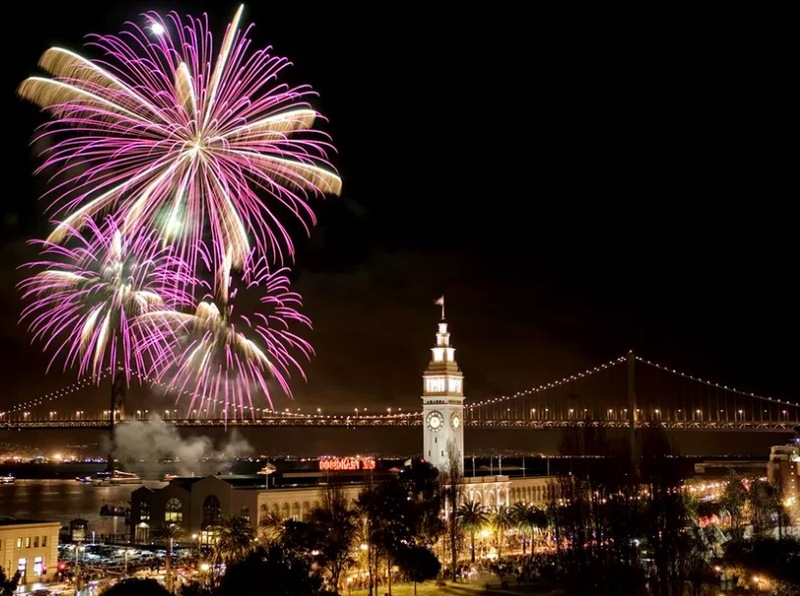 The big event to ring in the New Year in San Francisco is the Embarcadero Fireworks Show. It goes off at midnight above the Ferry Building. To view it from the street, stand near the end of Market Street at The Embarcadero. Avoid standing in front of the Ferry Building, where the building will block your view. You can also watch the fireworks from inside at hotels with a good view, especially the Hotel Vitale, Harbor Court, and the Hyatt Regency, but you’ll need to make reservations well in advance. San Francisco residents enjoy having a New Year’s Eve late afternoon picnic in Dolores Park at Dolores Street and 19th Street. They usually show up at sunset with champagne and beer to toast the end of the year while enjoying the park’s gorgeous city views. You can take a sail around the bay, have dinner, and dance the night away on a Hornblower’s New Year’s Eve Cruise, aboard the paddle wheeler San Francisco Belle or try the Commodore New Year’s Eve Fireworks Dinner Cruise, which departs from Alameda’s Mariner Square. The Speakeasy New Year’s Eve Cruise aboard the Fume Blanc is one of the first San Francisco celebrations to sell out every year, and it’s no wonder when you think about the music and blackjack tables to keep you entertained when you aren’t looking at the scenery. The most exciting and interesting thing about the New Bohemia New Year’s Eve is the location in the Old San Francisco Mint. Also exceptional is the staging by Vau de Vire, who attract edgy artists whose works would be at home at Burning Man, along with a great lineup of musical performers. Another fun idea is the annual celebration at the USS Hornet. The old aircraft carrier is docked across the bay in Alameda, where you can count down to midnight from the Flight Deck, with a gorgeous San Francisco view. San Francisco Station lists all the big San Francisco New Year’s parties. Instead of going out for the evening, host your own private party. Reserve a room in a hotel that has a great view and have dinner and drinks delivered. If you’re choosing this option, it’s best to call the hotel directly to make reservations to be sure you don’t accidentally end up with a scenic view of an elevator shaft. The JCB Tasting Lounge at the Ritz Carlton is hands down the best place in town to enjoy some fine sparkling wine in luxurious surroundings and a great place to start your evening. It’s small and fills up quickly, making reservations a must — and the earlier, the better. It’s not exactly a party, but you can also get a jump on the celebrations by going to the New Year’s Eve performance of Beach Blanket Babylon. City Kayak takes just 30 experienced paddlers out for midnight outing. The lucky group, led by guides in a motorboat, paddle out for a front-row fireworks view and a glass of ice-cold champagne. If you’re celebrating the new year with the whole family, you can enjoy ice skating in Union Square or near the Embarcadero Center. And take the kids to dinner at Burger Bar on Macy’s sixth floor where you can look down on the lighted square below. BART extends their service until 3 a.m. on New Year’s Eve, with extra trains running right after the fireworks show ends. Caltrain also provides free service, with four post-fireworks trains. AAA provides a complimentary ride and vehicle tow up to 7 miles from the point of pickup to drivers who have consumed alcohol. Ask for a Tipsy Tow by calling 1-800-400-4222. This service is available whether or not you’re an AAA member.